. Ishidoro and Haiku .
. toomyoo kuyoo 灯明供養 light offerings .
. Steinlaterne (ishidooroo石灯籠, ishitooroo) . 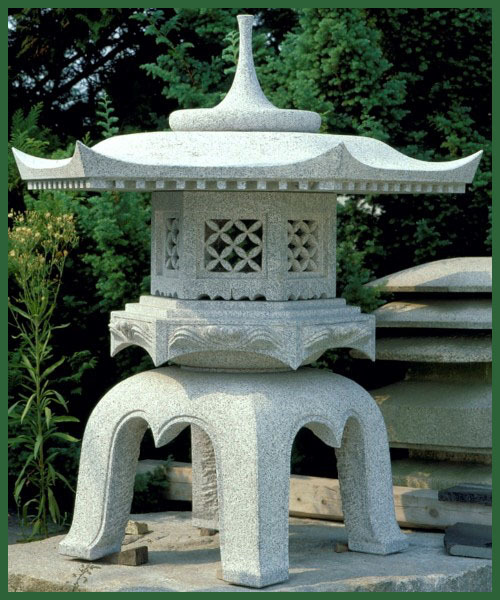 is a traditional lantern made of stone, wood, or metal. Like many other elements of Japanese traditional architecture, it originated in China; however, extant specimens in that country are very rare, and in Korea they are not as common as in Japan. In Japan, tōrō were originally used only in Buddhist temples, where they lined and illuminated paths. Lit lanterns were then considered an offering to Buddha. During the Heian period (794–1185), however, they started being used also in Shinto shrines and private homes. ... Tōrō can be classified in two main types, the tsuri-dōrō (釣灯籠・掻灯・吊り灯籠 lit. hanging lamp), which usually hang from the eaves of a roof, and the dai-dōrō (台灯籠 lit. platform lamp) used in gardens and along the approach (sandō) of a shrine or temple. 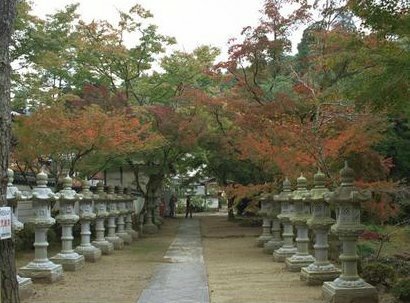 The two most common types of dai-dōrō are the bronze lantern and the stone lantern, which look like hanging lanterns laid to rest on a pedestal. 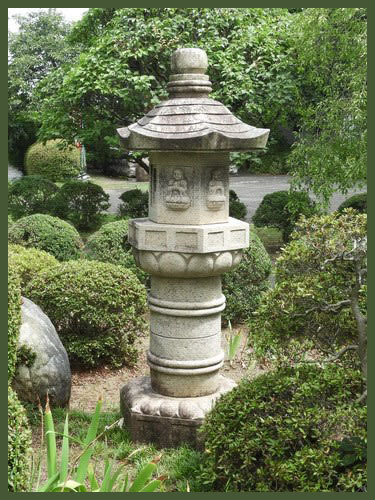 ... A dai-dōrō is most often made of stone, and in that case it is called ishi-dōrō (石灯籠 literally stone lantern). The onion-shaped part at the very top of the finial. The lotus-shaped support of the hōshu. A conical or pyramidal umbrella covering the fire box. The corners may curl upwards to form the so-called warabide (蕨手). The fire box where the fire is lit. The platform for the fire box. 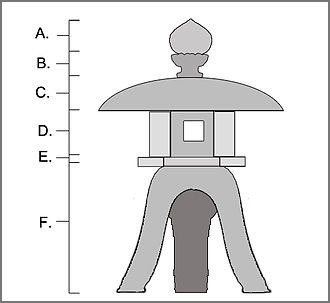 The post, typically oriented vertically and either circular or square in cross-section, possibly with a corresponding "belt" near its middle; occasionally also formed as a sideways coin or disk, as a set of tall thin lotus petals, or as between one and four arched legs (in "snow-viewing" lanterns); absent in hanging lanterns. The base, usually rounded or hexagonal, and absent in a buried lantern (see below). A variously shaped slab of rock sometimes present under the base. A type of stone pagoda with a hexagonal or octagonal base, a banner-shaped shaft, doushin 幢身, a niche, a coping stone shaped like a roof and one or more onion-shaped decorative jewels *houju 宝珠, on top. Some sekidou have no base so that section is inserted directly into the ground. Sanskrit letters and /or Buddhist images are carved on each side of the shaft. Some sekidou have octagonal or hexagonal shafts. Many have only a shaft and roof. Sometimes they resemble stone lanterns without a light box. According to some scholars sekidou probably evolved from kasatouba 笠塔婆. The oldest extant date from the Kamakura period, but many were made in the late 14c, and after. A type of stone lantern, ishidourou 石灯籠. Shaped like a Buddhist memorial sekidou 石幢, it has a hexagonal or octagonal base with a faceted pillar on it. On top of the pillar is the fire box, topped with canopy and sacred jewel, common to most stone lanterns. The special characteristic of the sekidougata ishidourou are the 6 buddhas, carved in relief on each face of the fire box. Originally derived from the sekidou, a monument displaying Buddhist relief carvings, it is thought that the fire hole was carved out to adapt the monument to function as a lantern. Good quality granite found in the Makabe area of Ibaraki Prefecture has been used to make a variety of useful articles since ancient times. The actual working of stone in the area began around the end of the Muromachi period (1333-1568) with the making of Buddhist stone articles around Nagaoka in Makabe-cho. The earliest confirmed Makabe Ishidoro stands in the temple compound in Makabe-cho. It was made by Kubota Kichibei in 1824, and he was responsible for establishing the skills and techniques of the craft. of these lightly colored lanterns are their superb craftsmanship, the light touch of the beautiful carving and their sense of weightiness. They provide traditional Japanese gardens with an added quality and elegance, their special features being accentuated further by the moss which tends to grow on the stone. Apart from garden items, lanterns and other items are also made for use at shrines and temples. What is Izumo stone lanterns ? Izumo stone lantern is stone lanterns produced in the city of Sakai Minato in the Tottori prefecture, and in the cities of Matsue and Izumo in the Shimane prefecture. They are made of Kimachi stone, fine-grained tuffaceous sandstone quarried from the Kimachi area of Shinji town. Izumo stone lanterns can be distinguished by their deep presence and harmony with traditional Japanese gardens. The Kimachi stone is highly absorbent and mosses grow quickly on it. Therefore the stone works seem to absorb the garden's atmosphere and effortlessly blend within the nature. Also, they have long been appreciated as a way of expressing wabi sabi (the beauty of simplicity and nature harmony) in the traditional Japanese gardens. After many years, the stone color changes from the freshly quarried bluish gray to a subtle grayish brown. It is said that Sen no Rikyu (influential master of the tea ceremony, 1522-1591) was captivated by gardens with Izumo stone lanterns, and so along with the spreading tea ceremony and the wabi sabi culture, the stone lanterns became increasingly popular throughout Japan. In addition to their aesthetic beauty they have good weather resistance to both hot and cold climates, which is why we can still find Izumo stone lanterns that were made in the Edo period (1603-1868) today. With a rich variety of shapes and types numbering around 130 or more, Izumo stone lanterns are widely appreciated even nowadays in Japan. The origins of Izumo stone lanterns dates back to the Nara period (710-794) and Heian period (794-1185) when they were used as lights. In the early days granite was used and later, the Kimachi stone, tuffaceous sandstone formed about 14 million years ago in the Izumo region came to be used. 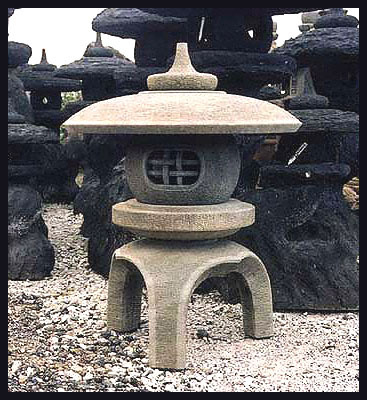 In the Azuchi momoyama period (1573-1600), along with the growing popularity of the tea ceremony, Japanese gardens with a wabi sabi (the beauty of simplicity and nature harmony) theme were increasingly in vogue, resulting in a demand for attractive stone lanterns in harmony with the garden. During the Edo period (1603-1868), the lord of the Matsue domain saw the economic value in the stone and started using it as a construction material in the domain. More importantly, he prohibited the Kimachi stones leaving the domain and restricted quarrying of the stone. This policy was at once protective of the local industry and also compelled masons to settle in the area. From the Meiji period (1868-1912) onward, stone lanterns came to be used not only for landscape architecture, but also for interior decoration, and today, with an increasing demand from overseas, Izumo stone lanterns have earned a high reputation as works of art.
. sotoba 卒塔婆 stone stupa, grave marker .